What if a customer would not like to spend money calling the company? He could provide his phone number and the company can call him back. The way it works is that you put an inputbox onto your company’s website. The customer types his/her phone number and clicks ’Submit’. Then a phone will ring inside your company. When a member of the support staff picks it up, the call will be transfered to the customer. So when the support staff member picks up the phone he/she will hear its ringing on the other side. When the customer picks up the phone, they can start the conversation. The telephone which will answer the callback request should already be added to the system as an extension. If it's not, follow these steps if you want to connect an analog phone or a desktop VoIP phone. You need to register an API Extension too, because when the customer clicks ’Submit’ to request a callback an API extension will call the employee. 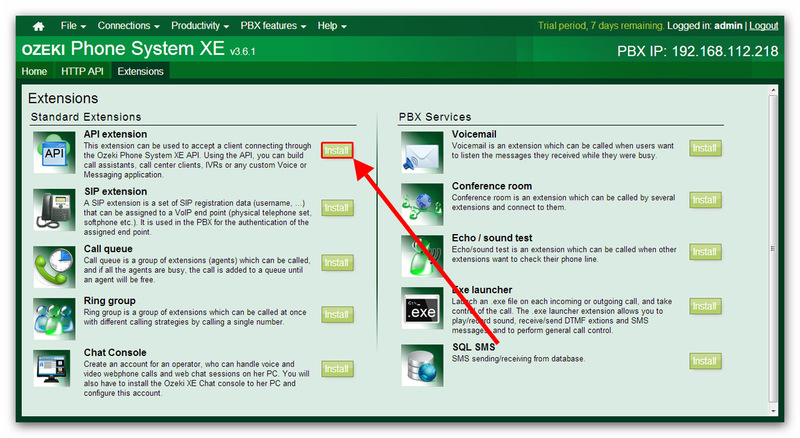 On the right side of the Ozeki Phone System XE GUI you will see a green bordered box called Extensions. Click ’Add’ (Figure 1). On the left half of the screen you will see an ’API extension’ label. Click the ’Install’ button next to it (Figure 2). Type in the extension phone number and click ’OK’. The API extension has been installed successfully. (Figure 3). The customer types his/her phone number into the inputbox and clicks ’Submit’. You need to save the phone number on a server. Watch the workflow of the call command to understand it better (Figure 4). If you want to implement a callback request, you have to be familiar with the HTML language, and with a server-side scripting language such as PHP or ASP. First of all, you are going to create a simple HTML file, which will contain only two things: a data field, and a submit button. 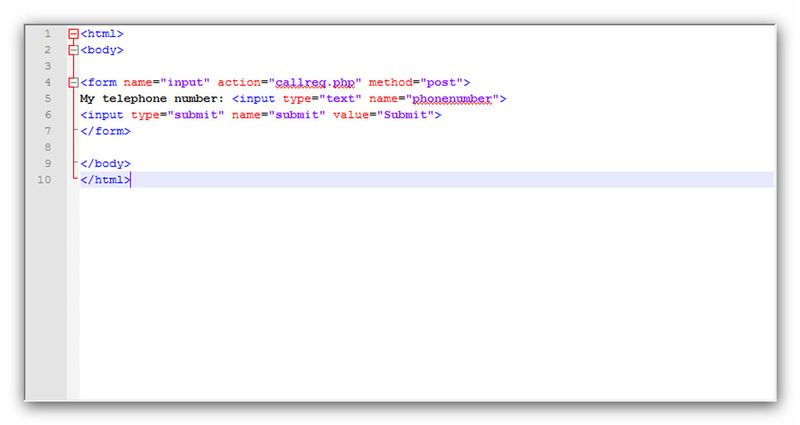 On Figure 5 you can see the HTML code of the index.html which will create the website used in the guide. 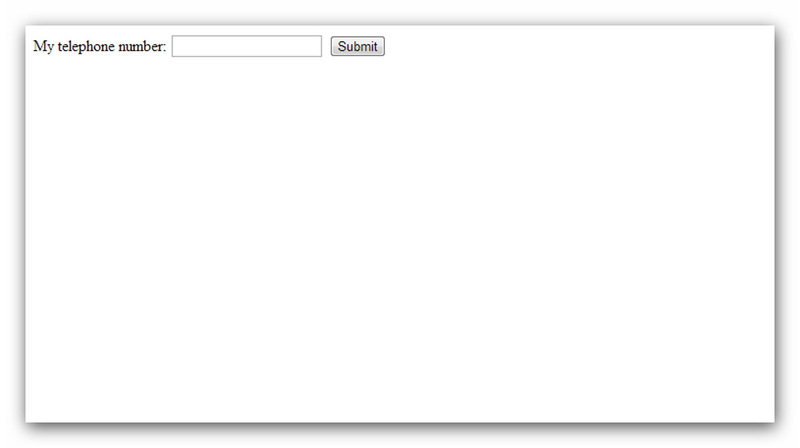 On Figure 6, you can see the HTML file is opened in a web browser. $OzekiAddress: This contains the IP address of the Ozeki Phone System XE and the port of the API extension which is 7780 by default. $ApiExtension: The number of the API extensions within the Ozeki Phone System XE. $CallerId: This is the number that the customer will see, when he gets a call. $CallerDisplayName: This is the name that the customer will see, when he gets a call. $URL: This is an URL which contains a file with XML data. This will be explained futher below. After the command is formed in the proper way, and all the mandatory data is given, the Application delivers the info to the Ozeki Phone System XE. First, the customers number will be dialled from the Ozeki Phone System XE. 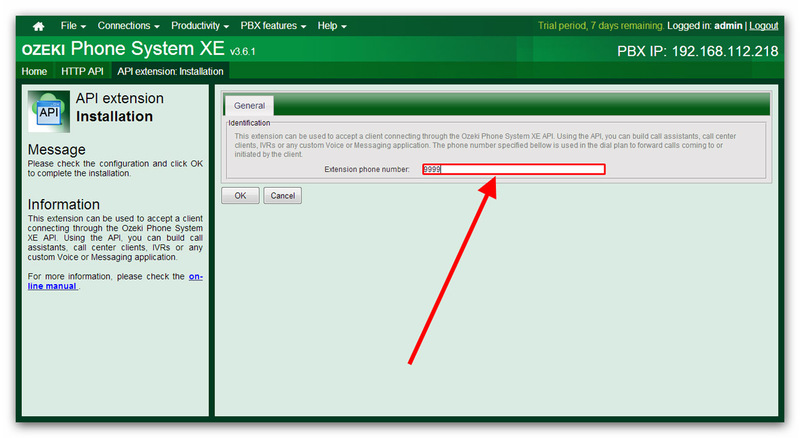 If the customer answers the call, the Ozeki Phone System XE will send a notification back to your Application about the connected call. This is called the callconnected notification. 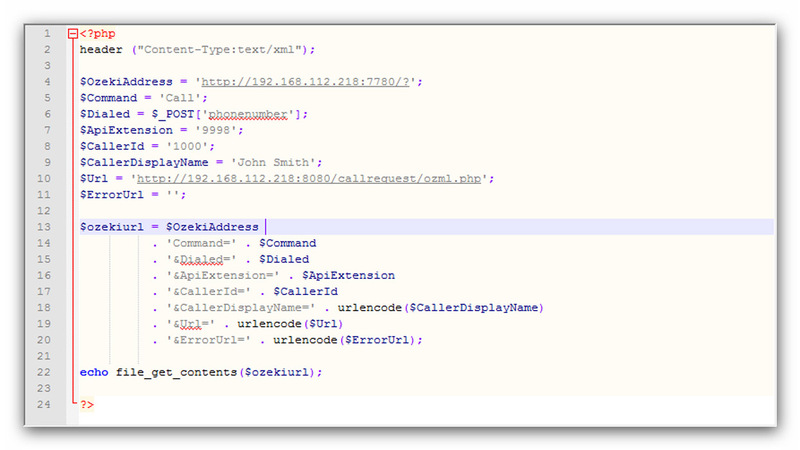 This Application will answer the notification, and this is where the $URL part of the Call command gets important. A Response will be sent back to the Ozeki Phone System XE. The response is an XML data (contained in a .php file in this guide) that contains the phone number of the employees at the company who will answer the call of the customer. Ozeki Phone System XE gets this response data from the $URL which has been previously provided for it in the Call command. <!-- The call will be blind transferred to another extension. Delay: This data provides information about the amount of time, the call will be delayed. Speak: The data contained between these tags will be told to the employees by a robotic voice. 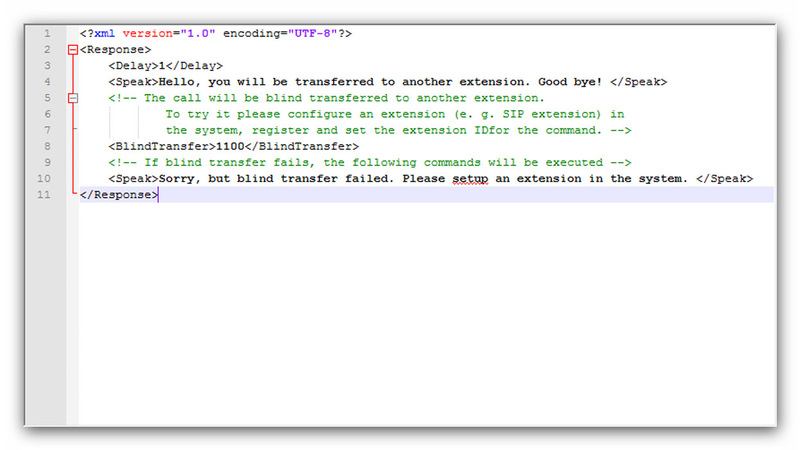 BlindTransfer: Here, you have to add the phone number of the employees, this is what makes the callback request possible. 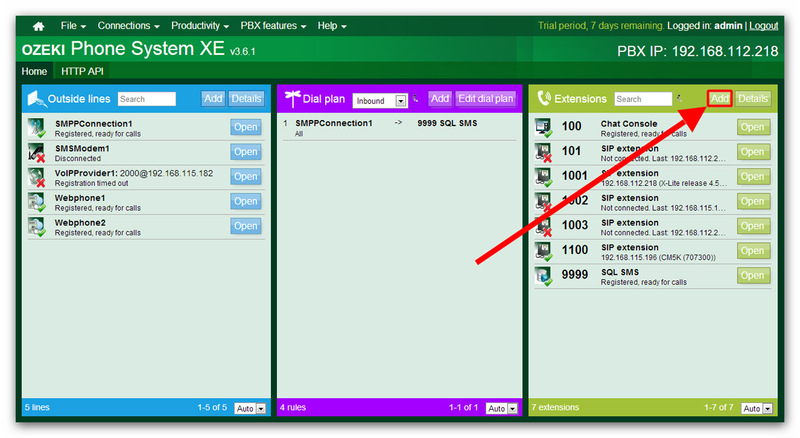 After the Ozeki Phone System XE gets the response, it will dial the employees on the number 1100 at the company through the HTTP API Extension. When an employee answers the call, the Callback Request is served, and the customer got called back as he wanted. This last part is about making a Ring group. It is important, because the xml data of the Response will only contain one phone number, so without a Ring group, only one employee could answer the callback request. Here you can find a detailed guide to help you with this. 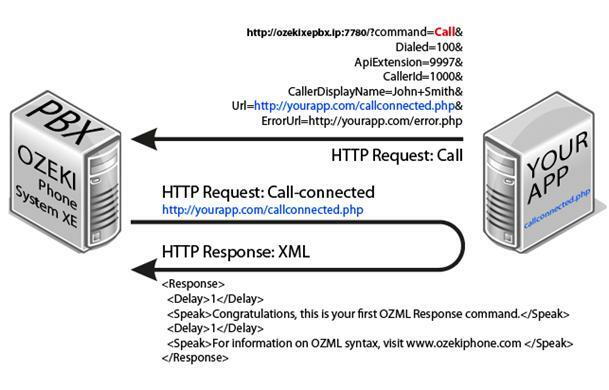 The guide above showed you how to setup an API Extension in the Ozeki Phone System XE, and how to implement a callback request using HTML, and PHP languages. If you follow this guide step-by-step, and read it paying attention, you will be able to make your own web application and make it communicate with the Ozeki Phone System XE, resulting in a served callback request.